Early Tuesday morning Windstar’s Star Pride ran aground while anchoring near the Panamanian island of Isla de Coiba. While passengers were ashore at the private island event, the ship’s technical team inspected the hull and found damage which made the ship unsafe to continue the voyage. Details appeared in the December 23 edition of Cruise News Daily. A few weeks ago we told you about Carnival and the New Orleans Saints partnering on an initiative to collect canned goods for the Second Harvest Food Bank in New Orleans by sponsoring a contest for New Orleans’ schools. 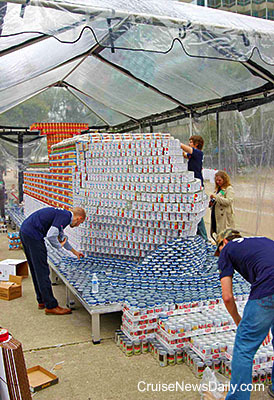 The effort resulted in 17,000 cans of food being collected for Second Harvest. But before Carnival turned over the cans, they saw an opportunity to do something that seems to come natural to Carnival - they built a cruise ship and displayed it at Monday night’s Saints game. The complete story appeared in the December 23 edition of Cruise News Daily. Photos courtesy of Carnival Cruise Line. All rights reserved. May not be copied or used without permission. An man being investigated for a child abuse charge disappears for a month and then is found when he went on a cruise. Carnival Corp brands going cage-free for their eggs. Details appeared in December 23 edition of Cruise News Daily. When Carnival’s Fathom brand was announced, it sounded pretty austere and focused on social impact projects. As the inaugural draws closer and we get more details, it appears there will be more and more opportunities for relaxation and fun - while still being immersed in the culture of the destination. On the Dominican Republic itinerary, passengers sailing aboard Adonia will be spending four days in port at Amber Cove. When they are not doing a social project, Fathom has now released a list of leisure activities (a/k/a shore excursions) that are available. An eight-year-old boy died Monday afternoon as a result of drowning in one of the swimming pools aboard Royal Caribbean’s Liberty of the Seas. Costa's winter Caribbean program returned to Port Everglades for the first time in four years today. The first step in Crystal’s ambitious growth plan became reality yesterday when the luxury yacht Crystal Esprit officially joined the fleet by being christened in Mahe in the Seychelles. March is right around the corner. That’s when Empress of the Seas will return to the Royal Caribbean International fleet from her sabbatical with RCCL’s Pullmantur brand. And that also means Royal Caribbean has just finalized plans for Empress of the Seas’ itineraries and onboard programs. It will be a homecoming of sorts with the ship sailing short cruises from Miami as it used to, but Royal Caribbean has a number of plans to differentiate Empress from the rest of the crowded South Florida market.